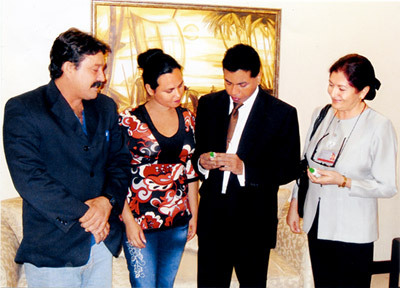 Cuban epidemiologists Dr. Aramis Martinez, Dr. Ms. Yelina and Cuban Ambassador Ms. Nirsia Castro Guevara look on while Director General Health, Dr. P.G. Maheepala examines the BTI bacteria. Two Cuban epidemiologists, Dr. Ms. Yelina and Dr. Aramis Martinez arrived in Sri Lanka yesterday (21st) morning and were welcomed by Cuban Ambassador Ms. Nirsia Castro Guvera. They have brought the BTI bacteria to Sri Lanka with them, a Healthcare and Nutrition ministry spokesman said. He said that the two specialists met Ministry Secretary Dr.Athula Kahandaliyanage and other ministry officials on Tuesday evening and they will meet Healthcare and Nutrition Minister Nimal Siripala De Silva this morning. The two specialists will visit Hambantota and Tangalle this evening. They will stay in Sri Lanka for a period of one week and study the situation. According to the spokesman the specialists have revealed that Dengue prevalence in Cuba is zero at the moment and the main reason behind the success is active community participation and positive response of the public. Cuba does not use any chemicals to control mosquito density and distribute BTI bacteria among all households once a week. Then the people apply BTI on all mosquito breeding sites located within their properties. The officials visit each and every household once a month and carry out awareness programs and inspections. Director General,Health Services, Dr. P.G. Maheepala explained the ongoing dengue control program to the two specialists.